The best multimedia creations can be enhanced tremendously using sound effects and music. Adobe Flash CS6 fully supports the import, placement, and control of sounds in lots of different formats, so you can easily bring in loops, sound effect files, and even music from your .mp3 collection. You can enhance your movie with background music or narrative, and sound effects can make using buttons and menus more intuitive. 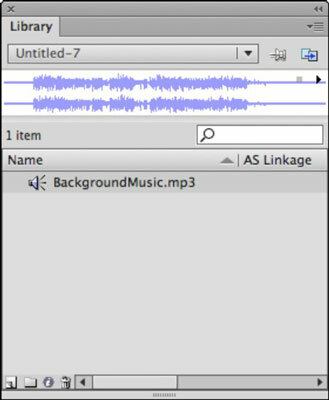 Flash can stream longer sounds (such as soundtracks or long-form narration) to minimize loading time so that users get right to the good stuff. Additional file formats are available with the optional QuickTime plug-in installed. Create a new Flash document and choose File→Import→Import to Library. Browse and choose an .mp3, .wav, or .aiff file from your hard drive and click Open (Windows) or Choose (Mac). Choose Window→Library to launch the Library panel. The sound appears in the library with a speaker icon. Select the sound and check out the Preview window. A waveform preview of your sound appears, and you can listen to the sound by using the Stop and Play buttons in the upper-right corner of the panel.